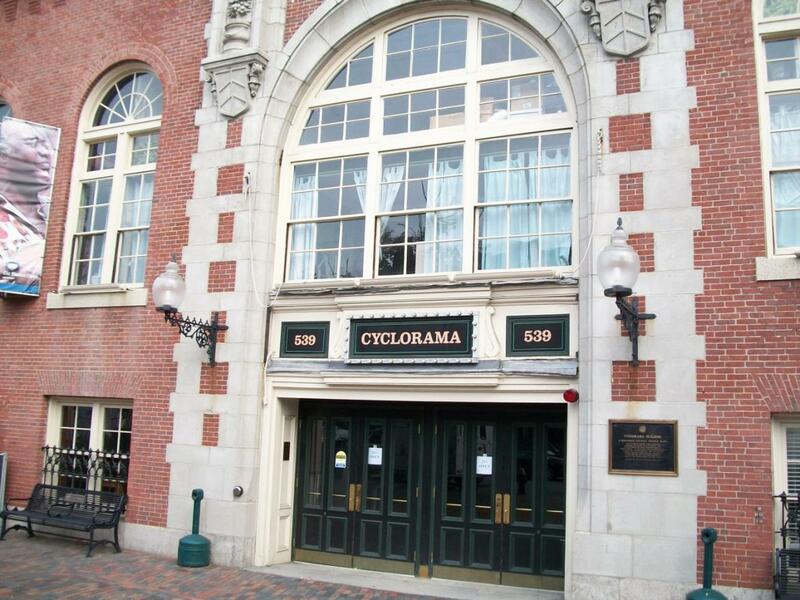 Originally built to house and exhibit Paul Philippoteaux’s “Battle of Gettysburg” painting, the Boston Cyclorama building, as seen in the late 19th century. This view was taken facing northwest circa the 1880s. 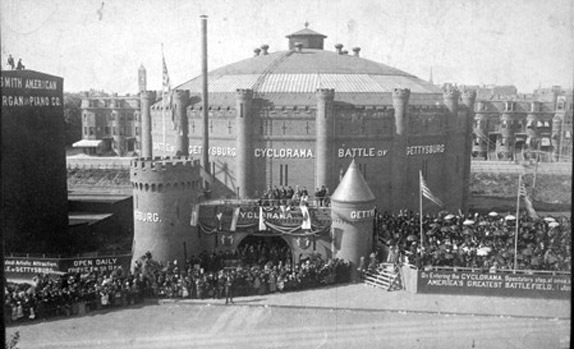 Designed by Charles Cummings and Willard Sears, Boston’s Cyclorama Building was constructed in 1884 to house Paul Philippoteaux’s “Battle of Gettysburg” painting. The version displayed here between 1884 and 1889 (the second painting of the battle Philippoteaux was contracted to paint) was later recovered and displayed in Gettysburg. 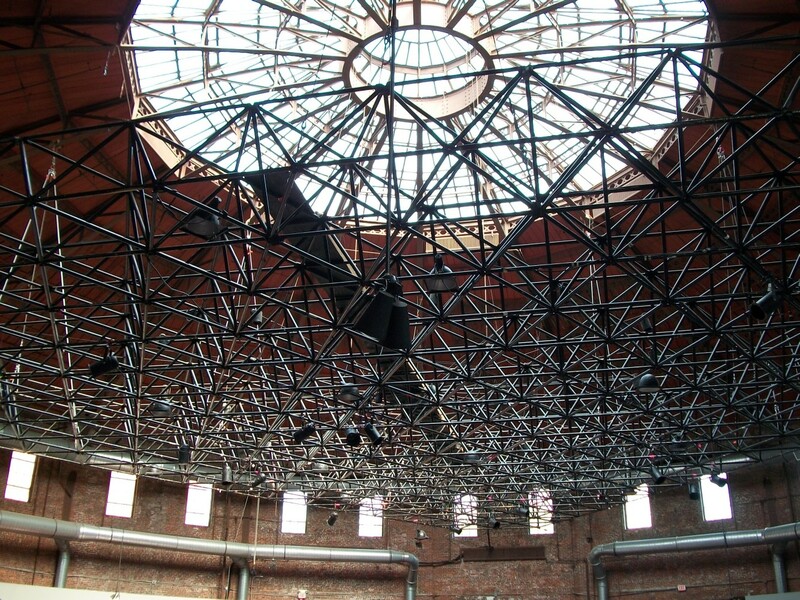 For a time in the late 19th century, the cyclorama experience was a tourism fad. 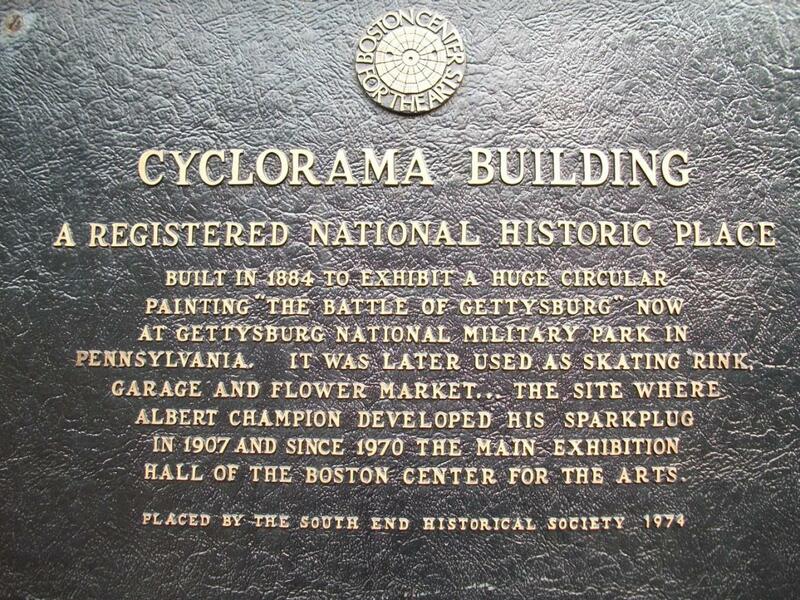 Across the country cyclorama experiences, in which some combination of music/lecture and diorama was used to exhibit a large painting (often of a great battle), were financed and created by companies like Charles F. Willoughby’s Boston Cyclorama Company in Boston. After the enormous success of Philippoteaux’s first Gettysburg cyclorama in Chicago, he was contracted to create a second version for Boston by Charles Willoughby. Between 1883 and 1884, with the help of a crew of 20 men, Philippoteaux completed the 377 feet wide and 42 feet tall painting. It opened to the public on December 22, 1884. Tremont Street is in the foreground and the John Hancock Tower protrudes from the center background. This view was taken facing northwest at approximately 9:40 AM on Wednesday, August 4, 2010. Though the painting was a success, the popularity of the cyclorama began to wane in the ensuing years. In 1889, a new painting of Custer’s last stand at Little Big Horn was exhibited, but did not achieve enough financial success for Willoughby’s company to continue the venture. The painting was left to languish in storage behind the exhibition hall and would not leave for Gettysburg until 1913. 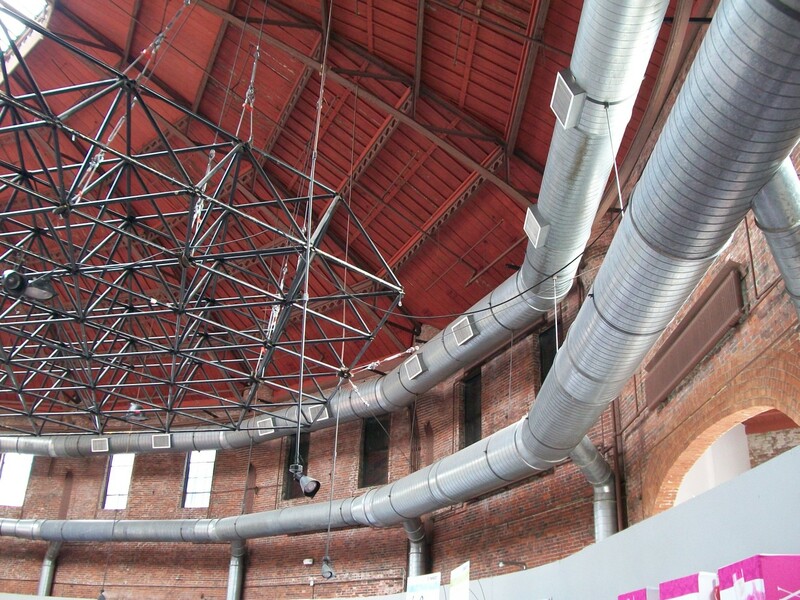 The building changed hands many times in the next 30 years and was put to a variety of uses (including a boxing ring). 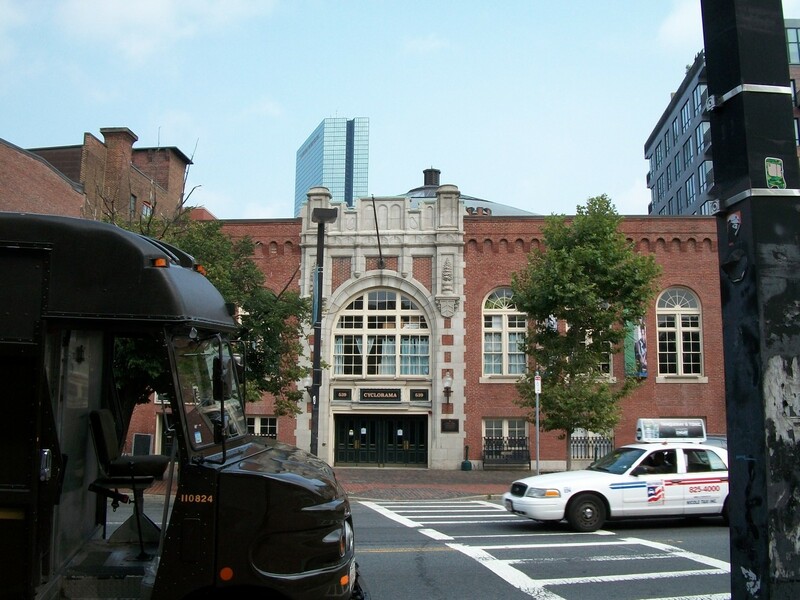 In 1922 it was purchased by the Boston Flower Exchange, who removed the battlements and ramparts around the rotunda and also removed the original copper dome, replacing it with a skylight that is still intact today. This view was taken facing northwest at approximately 9:40 AM on Wednesday, August 4, 2010. A closer view of the plaque outside the door. The building is currently owned by the Boston Center for the Arts … This view was taken facing south at approximately 9:40 AM on Wednesday, August 4, 2010. 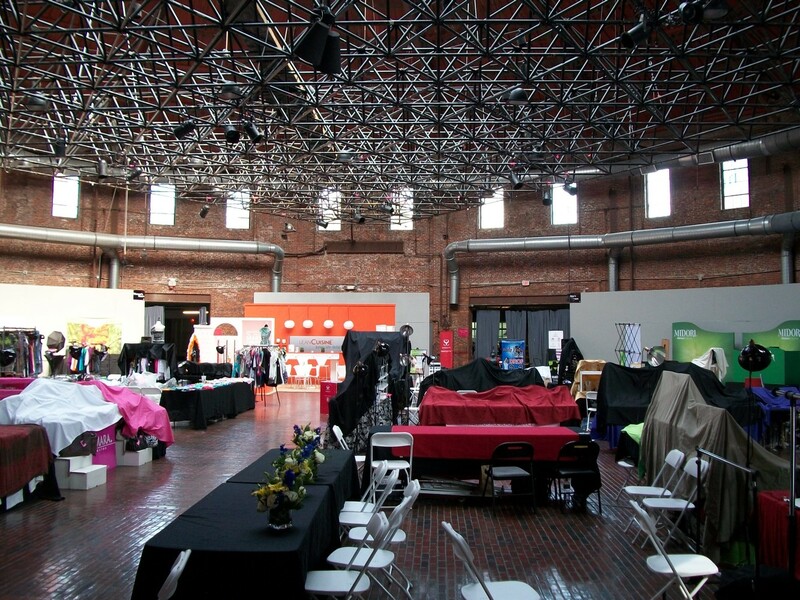 … and the space is rented out for events. 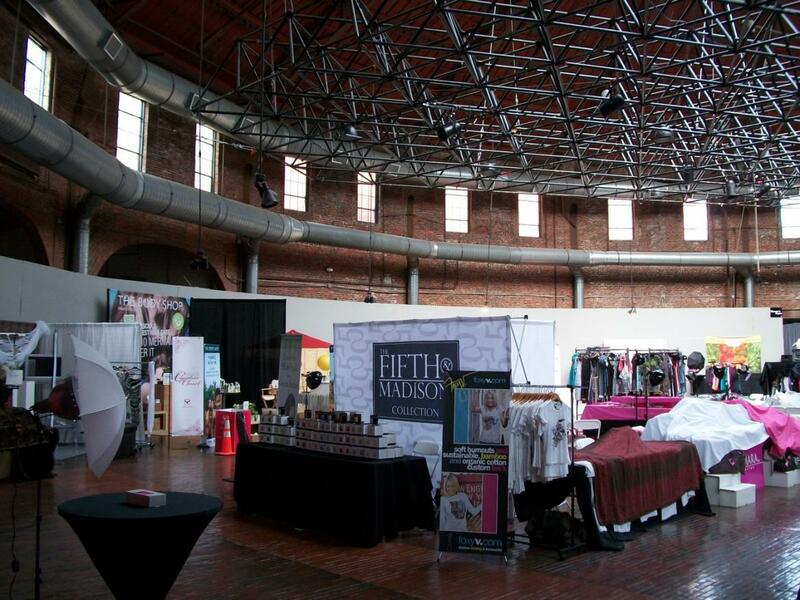 It is currently being used for various trade venues. When the Battle of Gettysburg painting was here, “viewers entered the Cyclorama through a long narrow hallway, ascended a circular, underground stairway, and found themselves in the midst of the battlefield.” This view was taken facing south at approximately 9:40 AM on Wednesday, August 4, 2010. Behind the photographer’s position was a raised platform — visitors would stand on the platform, which represented Cemetery Ridge, and would look out towards the painting/diorama. They would then walk back to the ground floor to get a better view of the painting down near the stone walls, artillery, and railings. This was to simulate the feeling of being immersed within the battlefield and to keep visitors from touching the painting. A lecturer/narrator would stand off to the side of the main rotunda room and narrate for visitors. This view was taken facing northwest at approximately 9:40 AM on Wednesday, August 4, 2010. Visitors would leave the painting through the basement of the building, where another painting of Philippoteaux’s was on display, titled “The Uprising of the North.” The rotunda was painted black and back-lit to simulate the illusion of sky. 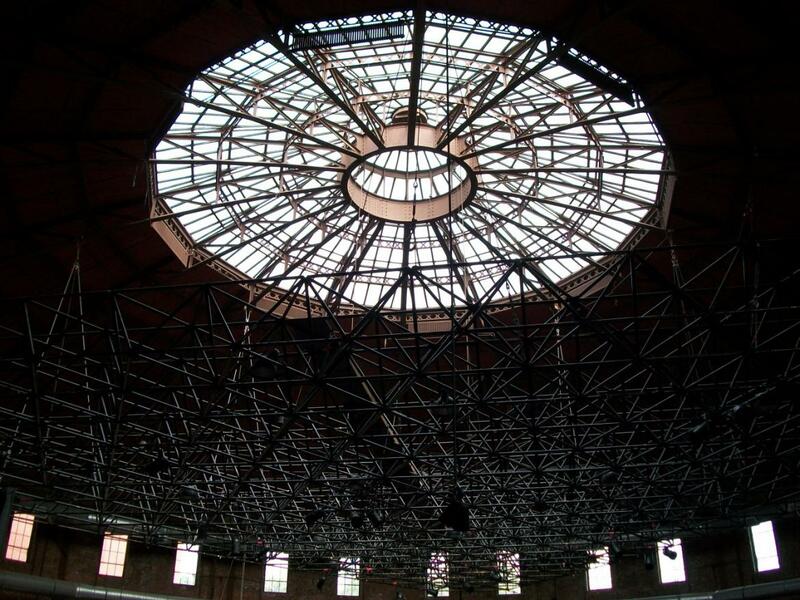 This 20th century skylight replaced the original copper dome that capped the structure. The dome height was increased with the addition of the skylight in 1923, making it the second largest dome in the US for its time. The first largest dome was the U.S. Capitol Building. This view was taken facing northwest at approximately 9:40 AM on Wednesday, August 4, 2010.